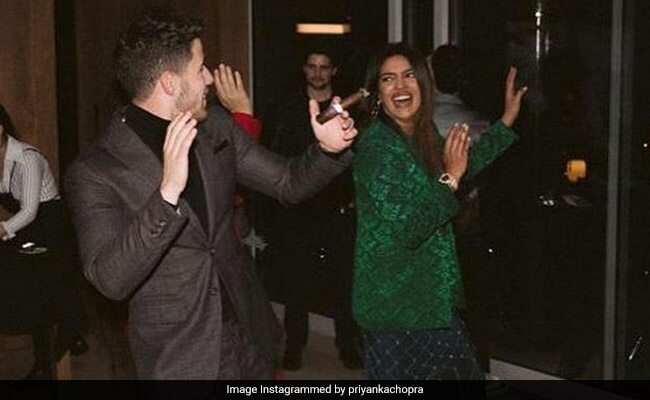 Just a day before the 61st edition of the Grammy awards, Priyanka Chopra and Nick Jonas let their hair down at a blockbuster party with their friends, who received nominations for music's biggest award night. The star-couple offered glimpses of the party on their social media accounts and all we can say is, they may have been missing from the Grammys but they sure did make up for it. After partying on Sunday, some of the guests headed to Los Angeles' Staples Center to attend the Grammys. Sharing photos from the party on Grammy day, Priyanka Chopra sent out best wishes to her friends: "What a great night celebrating our friends who are nominated for the Grammys... good luck to everyone tonight!" What a great night celebrating our friends who are nominated for the grammys.. good luck to everyone tonight!! Priyanka Chopra and Nick Jonas' "Grammy weekend" photos with none other than Shawn Mendes had our hopes high that the power-couple will be spotted at the Grammys. The couple also hung out with Sir Lucian Grainge, Chairman & CEO of Universal Music Group, who actually hosted the Artist Showcase in The Row. Meanwhile, Priyanka Chopra is busy promoting her third Hollywood film Isn't It Romantic? , in which she co-stars with Rebel Wilson, Adam DeVine and Liam Hemsworth. Isn't It Romantic? releases on February 14 and will be available in India February 28 onwards on Netflix. In Bollywood, Priyanka Chopra has Shonali Bose's The Sky Is Pink in the pipeline.